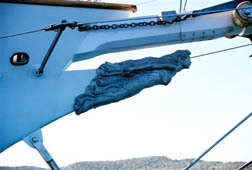 Watching seven sails unfurl along the 156’ deck of Arabella is a romantic image and full of grace. Waves surge under the figurehead on the bow with flowing energy as Arabella offers a guest the luxuries of a sailing vacation without any of the traditional sailor’s chores. 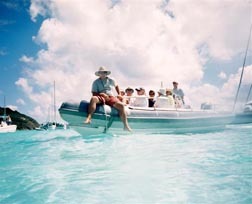 In six days of travel up to three dozen guests visit several islands in the US, British and Spanish Virgin Islands. 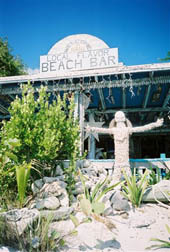 The week offers an afternoon on the wide white beach at Cooper Island, a visit to the famous Baths at Virgin Gorda, snorkeling inside the caves on Norman Island, a day at the sailor’s paradise of Bitter End Yacht Club, dinner at the Prospect Reef Club on Peter Island, and an evening of dinner and dancing at world famous Foxy’s on Jost Van Dyke. 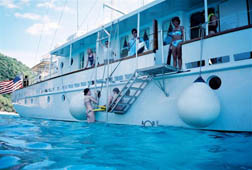 While each day is filled with potential adventure, guests are welcome to stay aboard if reading with the quiet rocking of the yacht is what they are seeking. Morning begins with the smell of coffee followed by mountains of salmon with capers, onions and cream cheese, or platters full of bacon, sausage and eggs, muffins, and there is always juice, yogurt and fruit available. Lunches generally consists of interesting salads, wraps and warm cookies or brownies. At the perfect hour freshly made baked brie, cheeses, dips and crackers or sushi is set up near the bar in the main saloon and guests warmed by the tropical breezes meet for cocktails. The saloon then became a charming gathering place for diners in groups of two to eight. Fresh fish, salads, outdoor grilled meat and vegetables, or both meat and vegetarian pastas were placed on the two buffets so guests could serve themselves. We had candle lighted dinners ashore under the stars at several islands during the week as well. After breakfast on most days, guests enjoyed the last cup of coffee and found comfortable spots to chat as the sails unfurled and we set out for a new location. 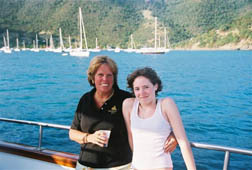 Sailing in the British Virgin Islands is generally line of sight, the longest passages being about 3 hours. 156 feet of deck space means that guests can always find padded places to read, work on a tan, sip iced tea and chat or snooze in sun or shade. Our cabins were bright and spaces concise without a lot of storage but certainly room for everything we need. Each cabin had its own “head” (shower, sink and toilet), telephone, climate control air, and a small satellite TV as well as several drawers and shelves. Some cabins were bunk rooms, others had double beds. None of us spent much time there as topside was so comfortable and we all seemed to be interested in watching the islands flow by. With the lingering effects of warm water swimming, tropical breezes and salty air the gentle rocking of the yacht at night made sleeping deep and sound. 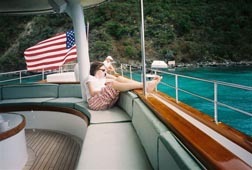 I have been to the BVI several times before, but I found myself telling our captain Sandy Sunderland that this had been my favorite way to see these islands. He told me that in the summer Arabella does cruises starting out of Newport RI, and going to Martha’s Vineyard, Nantucket and Cuttyhunk so I am thinking of joining this beautiful yacht with its friendly crew for that cruise as well. 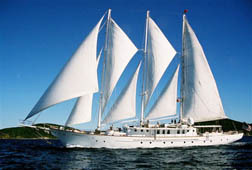 Each day of the six we were aboard had its own flavor shared with our small group. We made friends that we will see again, put on some weight, danced until we were exhausted, and came home so laid back that I could barely remember how to drive my car. Pretty much the definition of a perfect vacation as I see it.